The Cult of the Line and Weekly Drops. Theolus Jackson slouched against the stanchion separating him from the entrance of Supreme, the streetwear emporium on Lafayette Street in SoHo. He had registered on the company’s website to pick up a ticket assuring him a spot near the head of a line that by 10 a.m. that day spooled around the corner toward Broadway. The ostensible draw for Mr. Jackson and his comrades on that balmy June morning, the so-called drop prompting a couple of hundred fashion die-hards to snap open their wallets, was a jacket ($298) and companion shirt ($158), stamped with the image of a Richard Prince-inspired cowpoke, which sold out within moments after 11, when Supreme opened its doors. Did it matter? Not much. Though upmarket streetwear — hoodies, sneakers, skateboards, ball caps, sanitation-worker boiler suits — is the ostensible lure for these hunter-gatherers, the wares are just part of the draw. 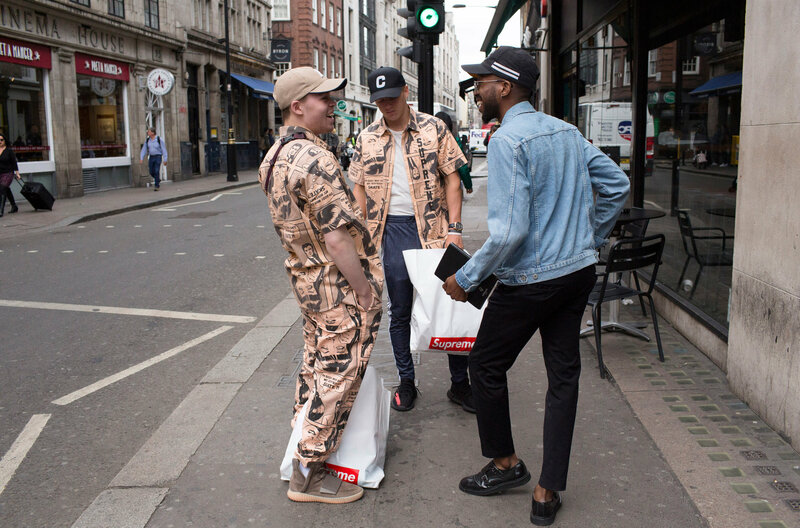 “These kids don’t come to go into the store,” said Jeff Carvalho, the executive editor of Highsnobiety, a content-and-commerce website and magazine focused on high-end streetwear. “They want to be in the line.” Casting an appraising eye on the restive Thursday morning scene, he drove home the point. 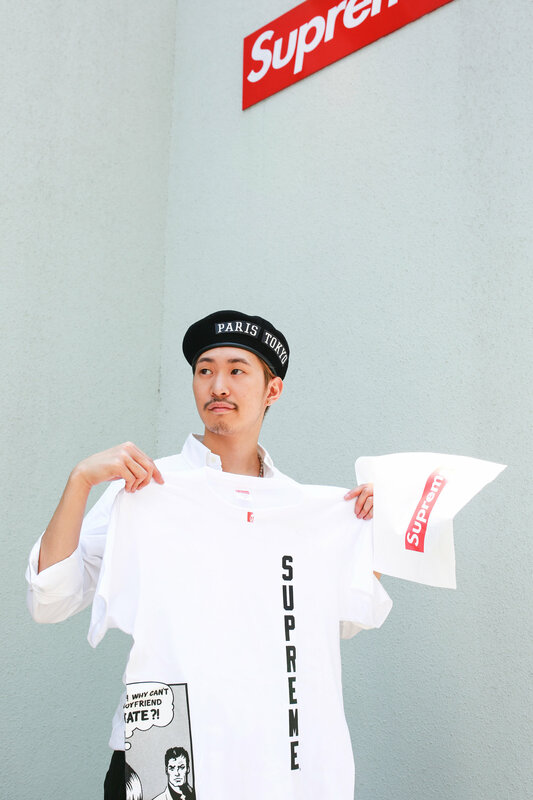 Mr. Carvalho and Jian DeLeon, Highsnobiety’s editorial director, make it their business to monitor the weekly drops at emporiums like Supreme, Nike Lab and Palace, the London-based skate-fashion store with a new outpost in New York. On this day, they had offered themselves as field guides to what promised be a highly engaging hybrid of tribal rite and street theater, a latter-day alterative to the once-ubiquitous bands of adolescents raucously swarming malls. His shouts and those of companions volleying from one end of the street to the other pricked up the ears of hypervigilant store personnel ready to pounce on infractions. But overbearing security and a building sense of pressure did not seem to ruffle the mood. For many of these strivers, the chance to swap insider intelligence and bask in camaraderie was, after all, the point. “Those things make the kids more agreeable to doing something that on surface you think is a sort of absurd proposition,” said Noah Callahan-Bever, the editor of Complex, an online youth-culture magazine that has chronicled the evolution of the line phenomenon in a series of videos. Absurd, for sure, when a “luxury” recliner can be reserved at the multiplex on an app like Fandango, and a puffer coat from Vetements summoned at a click at ssense.com, rendering the queue all but obsolete. Yet the line persists, a global trend stretching these days from Tokyo to Tucson and Berlin to the Bronx. Its members, millennials and their younger Gen Z kin, share a mind-set, making common cause of a yen for authenticity. What’s more, they defy facile stereotyping. A mere half-dozen years ago, a shared lust for skateboard and locker-room gear sustained the community. “A limited-edition sneaker was so rare that when two people were wearing it, you knew something connected them — certain music, certain art, certain fashion,” said David Fischer, Highsnobiety’s Berlin-based chief executive. But time, as he noted, wrought changes. 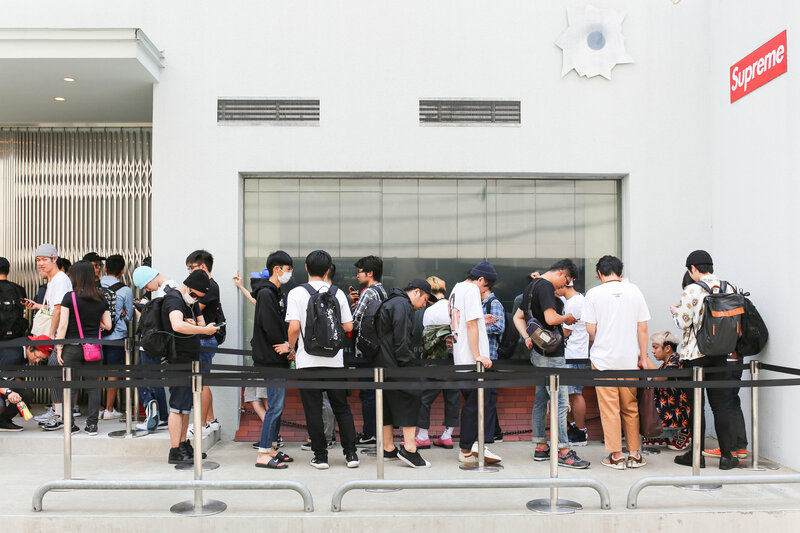 Today, the queue is partly a resellers’ market: energetic young entrepreneurs snapping up wares in multiples, then flipping them at soaring markups on eBay or selling them for pocket change to finance their own buys. 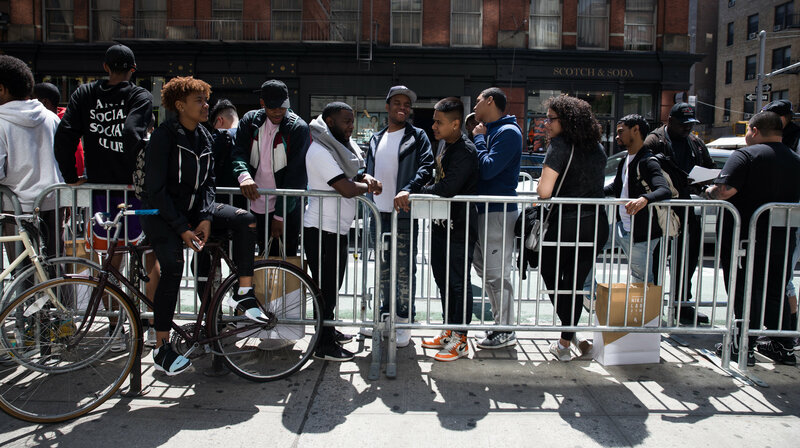 On this day, the spirit of commerce was lively on Lafayette Street, with vans lining the far side of the block, the trunks popped to display boxes and bags packed with limited-edition inventory from Nike, Supreme and other vendors — a lure for passers-by. “Reselling, it’s an easy way to make money,” said a tank-top-garbed youth who goes by the street name Young Sin. “I do this every Thursday. You can’t get locked up for it.” Young Sin, Y S to his friends, planned to pick up a cap for himself and offer additional, marked-up items to all comers. Shared interests with his queuing companions vary from gallery hopping to sports to music. “We’re big fans of Radiohead, and we like a bit of art,” said Mr. Gamble, the preening owner of a “pill shirt,” a Supreme item influenced by a signature artwork by Damien Hirst. The peak experience: going social with your trophy. And after? “It’s on to the next thing,” he said.